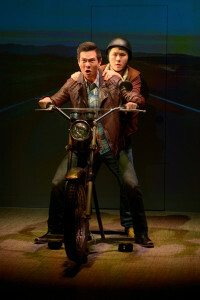 The American Conservatory Theater is presenting Qui Nguyen’s “Vietgone,” at the Strand Theater until April 22. 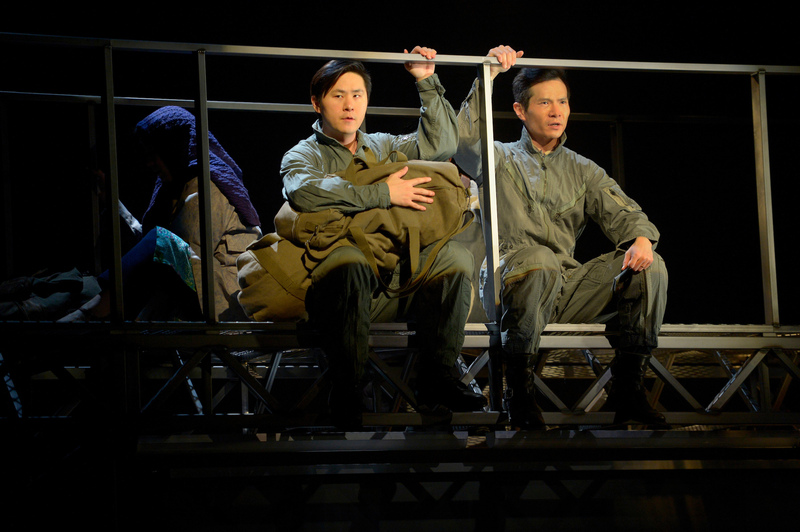 The story revolves around how two Vietnamese refugees fall in love, one is a fighter pilot, Quang (James Seol) and the other a U.S. Embassy worker, Tong (Jenelle Chu). 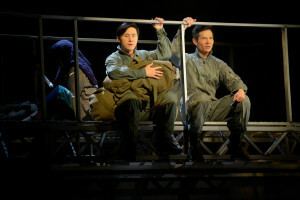 In the beginning, Nguyen slyly alludes to the characters being based on his parents, “Any resemblance to real persons, living or dead, is purely coincidental. That especially goes for any person or persons who could be related to the playwright. Specifically, his parents. Who this play is absolutely not about”. 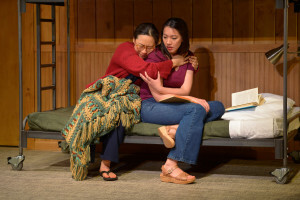 Tong is given the opportunity to escape the violence and politics caused by the Vietnam War via her job at the embassy, she’s allowed to take one other person with her. She chooses her mother (Cindy Im), forcing her to leave her brother behind. Quang has two children and a wife he’s barely seen as his pilot duty calls, but he intends to be with them as soon as he can. Unfortunately, his plane is discarded and they force him to stay in the U.S. Tong and him both end up at the same refugee camp and that’s where the emotional rollercoaster begins. The story is told through a mix of humor, intermittent musical set changes, and rap numbers. The dialogue is also sprinkled with a little bit of “shade” towards racist tropes and the fake “woke”. No matter what one believes about a situation or history, there’s nothing more important than having the perspective of a person who’s directly affected by it. Our parents, and how they tell their story becomes our history. Quang first meets Tongs mother who relentlessly flirts with him and lies about her age, one of the more comedic parts of the show. They establish a friendly relationship and while looking for her, Quang meets Tong. Tong likes to pretend she’s unaffected by emotions and lives as detached as possible, and immediately has a fling with Quang. Her mother walks in conveniently after they’re done and Quang is gone in a flash. And that’s how their love story begins. However, Quang is on a mission to go back to his family in Vietnam and exposes this truth right when Tong is starting to have feelings for him. The story then takes us to the motorcycle adventures of Quang and his friend Nhan (Stephen Hu) on their way to California to catch a flight back “home”. Nhan questions that belief, is it still home after all it’s been through, all that’s been lost? After all they’ve been through, and all they’ve lost? Although, the story centers around commonalties that we share as humans like love and friendship, the main crux of the story is to not assume that you know what someone feels about their history and experience. This is pointed out when Quang and Nhan meet a couple of hippies on the road and when Quang is being questioned by his son. People don’t choose to be in a country torn by war. It happens to them not because of them. This harsh reality is one people don’t seem to quite understand. Two people fall in love in this story but two people also have great losses in this story. They were torn apart from their families, their home, everything they’ve ever known. In situations like this, people are left behind and the only way one can move forward is by accepting the choices that one was able to make regardless of how hard they were, and the ones forced upon you. Through humor, Nguyen explores romance, family, tragedy, regret, abandonment, guilt, and pain. Vietnam was not a “mistake,” Quang tells his son, it is a country. Catch it while you can as this is not a perspective you’ll read in your history books. Tuesdays–Saturdays at 7:30 p.m. Wednesdays and Saturdays at 2 p.m.